I first tasted this bread when my husband and I went out to dinner years ago. The restaurant served it as part of a shortcake. This bread was on the bottom, macerated strawberries on top of that and then fresh whipped cream set the whole thing off. I knew, when I went home, that I would have to try to recreate this recipe. 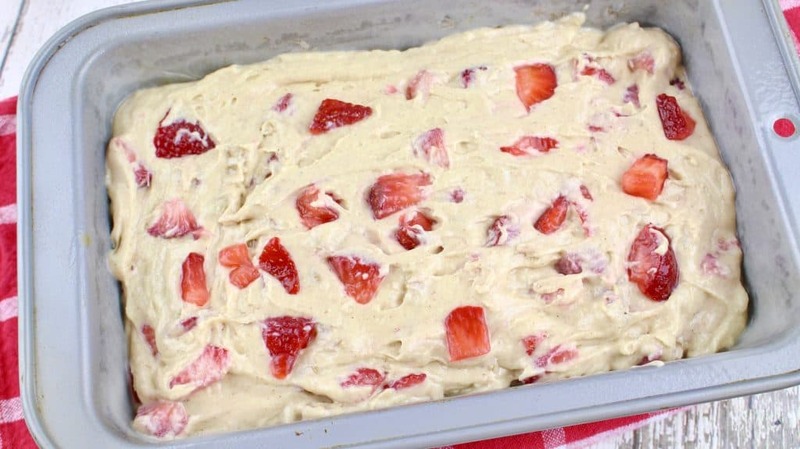 HOW DO I SERVE STRAWBERRY BREAD? 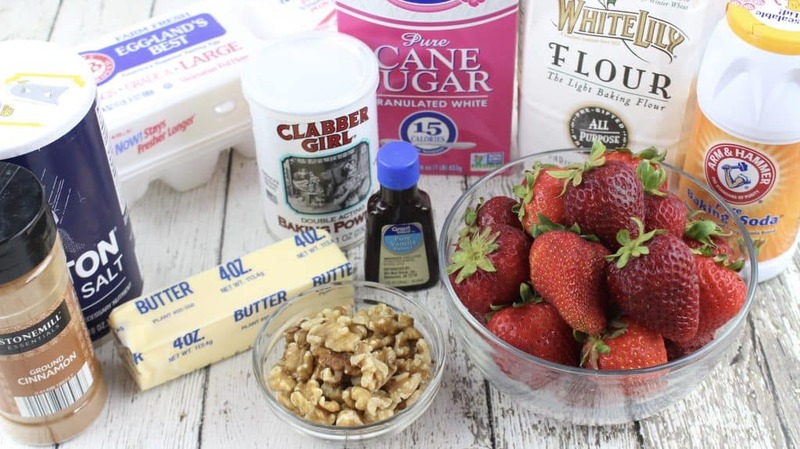 If you love my SOUTHERN STRAWBERRY SHORTCAKES then you will love this alternative. 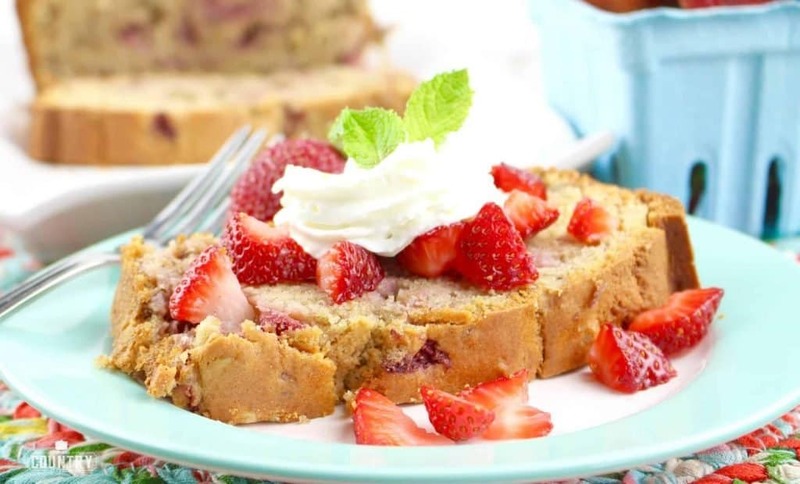 This strawberry bread isn’t overly sweet but is just sweet enough to make a perfect base for a different kind of “shortcake.” Obviously, you can certainly eat this all by itself (maybe with a little dab of butter) with your morning cup of coffee or tea. Or, you could even make these into muffins, if you prefer. 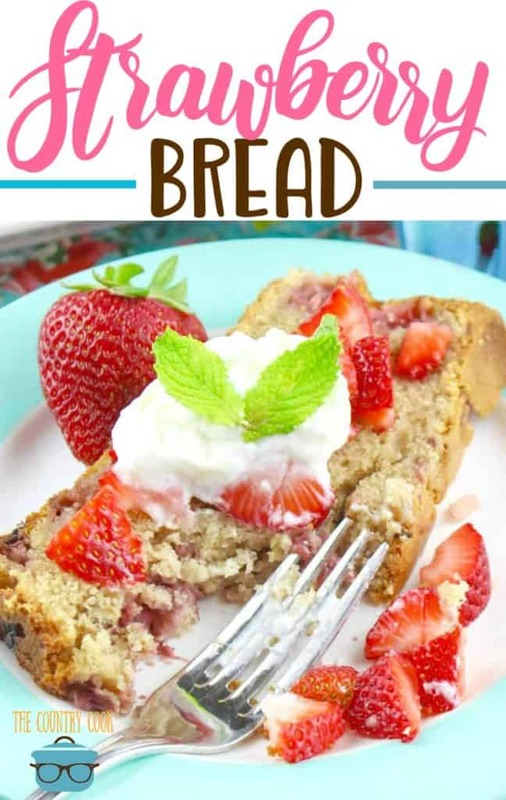 But my favorite way to eat this bread is exactly how I first tasted it ~ as a base for sweetened fresh strawberries and whipped cream! Preheat oven to 350 degrees F and place the oven rack in the middle position. Spray the bottom and sides of an 8-cup loaf pan (9x5x3 inch) with nonstick cooking spray. I like the nonstick spray that has flour in it. In the bowl of your electric mixer, or with a hand mixer, beat the butter until softened, about 1 minute. Add the sugar and continue to beat until light and fluffy. Add the eggs, one at a time, beating well after each addition. Add in the vanilla extract. Scrape down the sides of the bowl as needed. In a separate bowl, whisk together the flour, baking powder, baking soda, salt and ground cinnamon. With the mixer on low, add the flour mixture (in three additions) and sour cream (in two additions) alternately, starting and ending with the flour. Mix only until combined. 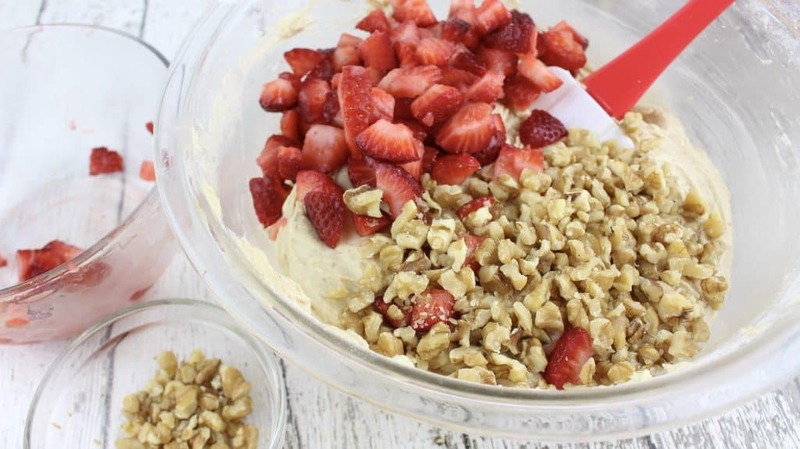 Gently fold in the chopped strawberries and walnuts. Pour the batter into your baking pan and bake for about 1 hour, or until the bread is golden brown and a toothpick inserted in the center comes out clean. Place on a wire rack to cool and then remove the bread from the pan. This bread can be frozen. Makes 1 loaf. 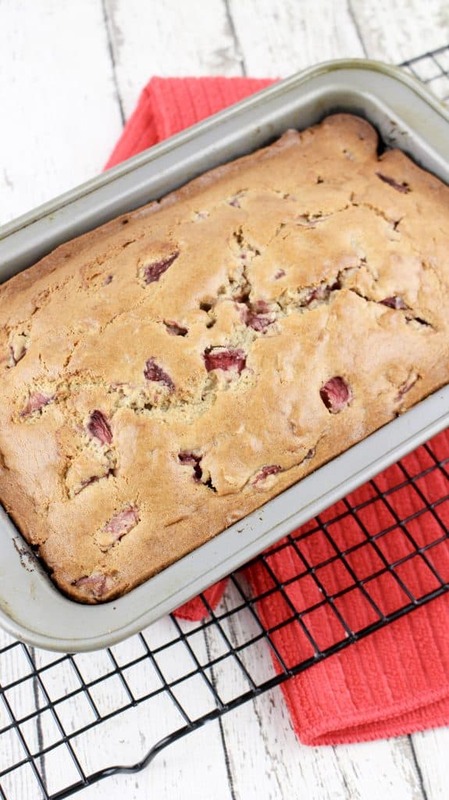 Strawberry Bread will be your new favorite, easy sweet bread! Made with fresh strawberries. Serve it sliced with sweetened strawberries and whipped cream! Preheat oven to 350F degrees and place the oven rack in the middle position. Spray the bottom and sides of an 8-cup loaf pan (9 x 5 x 3 inch) with nonstick cooking spray. 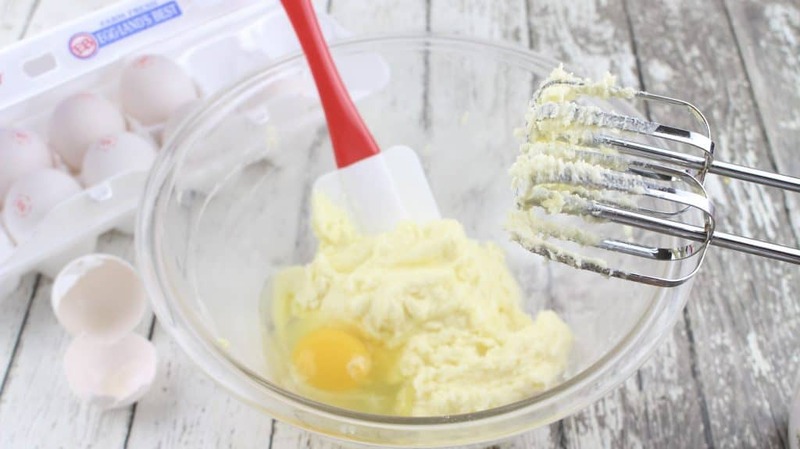 In the bowl of your electric mixer, or with a hand mixer, beat the butter until softened. Add the sugar and continue to beat until light and fluffy. Add in the vanilla extract. Scrape down the sides of the bowl as needed. 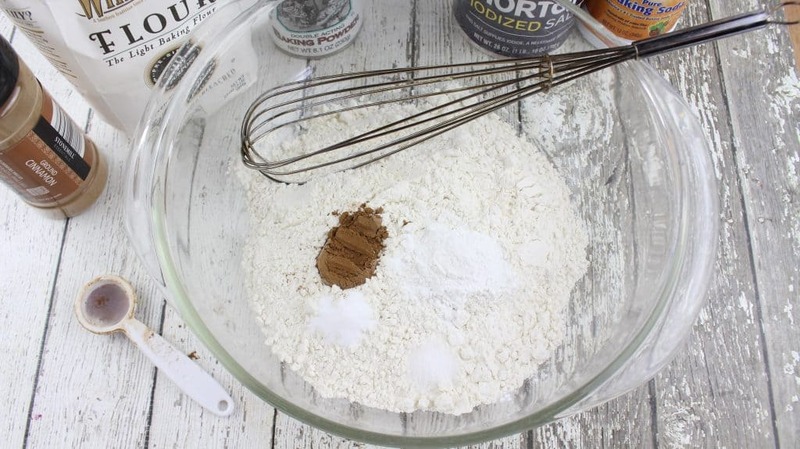 In a separate bowl, whisk together the flour, baking powder, baking soda, salt, and ground cinnamon. 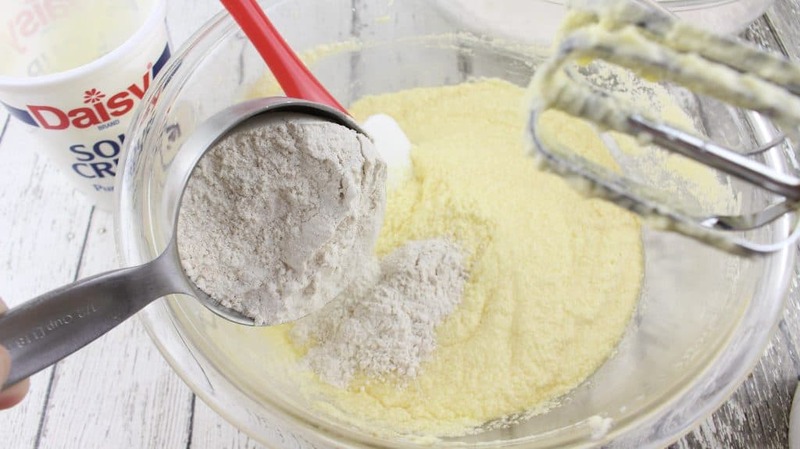 With the mixer on low, add the flour mixture (in three additions) and sour cream (in two additions) alternately, starting and ending with the flour. Scrape the batter into the prepared pan and bake about 1 hour, or until the bread is golden brown and a toothpick inserted in the center comes out clean. Serve warm or at room temperature. This bread can be frozen. Want more fresh fruit dessert dessert ideas, check these out! My mom use to make me strawberry bread and send it in a college care-package. Yum! 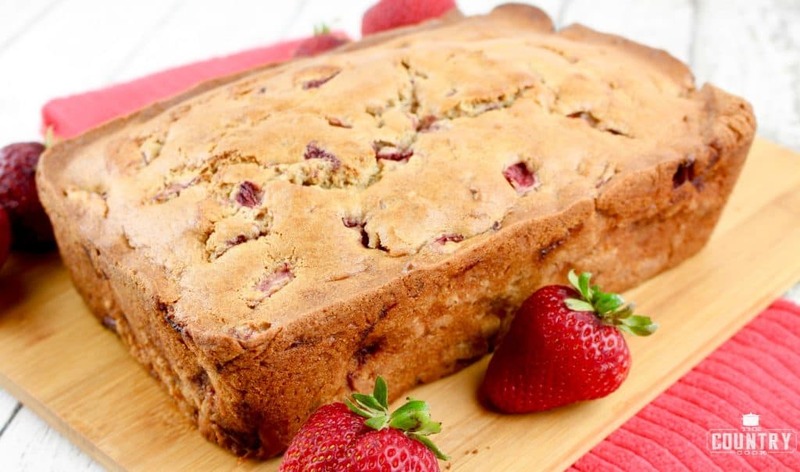 Your strawberry bread looks so good, especially topped with the strawberries. Yum! Hope that you had a wonderful Mother's Day! Bread like this as a shortcake, great idea. Vary the fruit and you can have seasonal fruit shortcakes year round. I am all about adapting, can you tell LOL, thanks. Looks SO yummy! I am all about the Strawberries right now. Strawberry Chicken Salad and Eton Mess baby! The one time I don't have fresh strawberries in the house. Sigh. This bread sounds so delicious and I know that itty bitty would love this. Yummy! What a great recipe. I picked strawberries yesterday. This will be perfect. I'm ready to use some of my remaining hand-picked berries for this! Thanks for sharing! Oh my this bread sounds so good! And anything that can turn into a strawberry shortcake is a definite winner in my book! Yum! I love strawberries! I bet this bread tastes so good! One of the grocers has strawberries on sale this week – buy one, get one free! Yay! Started a cooking blog! Name that recipe contest too! Come see me! P.S…I get compliments EVERY time I where my jewelry! Thank you again! … and now Brandie can make it better than the restaurant, hubby has never taken her out to dinner again. I'm probably wrong and you're taken out as you deserve. This looks SO good! Oh my lordy! I will be making this soon! I have a huge thing of strawberries I just bought. Can't wait to try this! 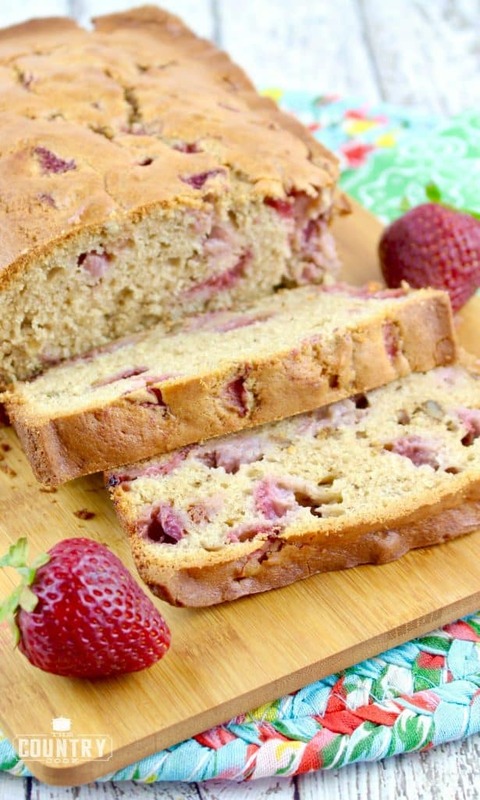 What a heavenly loaf – I have never had strawberry bread before, it sounds superb. This sounds so good! I can't wait for strawberry season here. Tonya – you need to share that cream cheese spread recipe – sounds wonderful! I've never had strawberry bread, but why not?!?!! Especially with farm fresh strawberries and whipped cream! YUM! Mmmm, I made strawberry bread last fall with fall berries and it wasn't that tasty. Thanks for reminding me of this delicious bread, I'll have to make some with fresh spring berries! I am bookmarking this for when strawberry season comes. 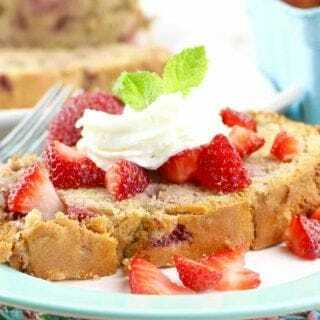 I love quick breads, but have never tried it with strawberries. Thanks! Another great strawberry recipe for me to do next month. I'm so excited for fresh berries. YAY!